Florida based author Carl Hiaasen is known for his clever and intricate novels. Prior to reading his latest novel, Bad Monkey, my only encounter with Hiaasen's writing was with his young adult novel Hoot. 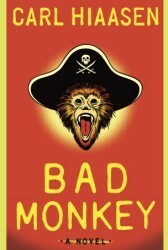 True to form, Bad Monkey sees Hiaasen set his story is his home state and cast it full of quirky characters. Andrew Yancey has fallen on hard times. An unfortunate incident involving a vacuum cleaner and his girlfriend's husband saw him demoted from his plush detective job in the Florida Keys. Relegated to "roach patrol", Yancey spends his day's enforcing health and sanitation standards at local restaurants. But remnants of his past career threaten to come back to haunt him. Namely, the human arm that currently resides in his freezer! Beyond Yancey's narrative, Hiaasen casts his novel with several other questionable characters. There's a Bahama native who is looking to curse another man. He turns to the island's local voodoo expert to cast a curse on the man. He also happens to be the owner of titular mammal who is said to have been cast in the Pirates of the Caribbean movies. Then there's Yancey's neighbor who is building an oversized mansion in a "get rich quick" scheme. The only problem is that no one wants to buy the out of place home. Yancey, who hates that the structure blocks his view of the Florida landscape, is doing everything in his power to sabotage potential buyers. In Bad Monkey, Carl Hiaasen delivers on all fronts. He expertly balances on the edge of absurdity, never allowing his wild story or characters to wander too far astray. Hiaasen's various narrative threads manage to entertain and maintain suspense. When they finally come together, you'll be as surprised as you are satisfied. While Bad Monkey never takes itself too seriously, it is a seriously fantastic read! This entry was posted on Tuesday, April 5, 2016 and is filed under Bad Monkey,Carl Hiaasen,Florida,Mystery,Satire,Thriller. You can follow any responses to this entry through the RSS 2.0. You can leave a response. This is definitely a more layered story with adult humor.